This RTC & Klimate board is a Real Time Clock (RTC) and environmental sensor (BME280) interface for the BBC microbit. The environmental sensor will give the ability to measure temperature, barometric pressure and humidity. The RTC will give the ability to read current time and date. The micro:bit RTC also has an expansion port for adding additional I2C devices with a 3V supply (for example, an OLED display), and another for extra ZIP LEDs. Kitronik have added custom blocks for the RTC & Klimate board to the Microsoft MakeCode editor. The blocks can be added to the editor by; clicking the cog in the top right of the editor. Then select 'Add Package' from the drop down menu. This will open a dialog box with a search field, type Kitronik into the search field. This will bring all of our custom block sets, scroll down to the RTC blocks and select them. The blocks will now be added to your menu and can be used in your programs. 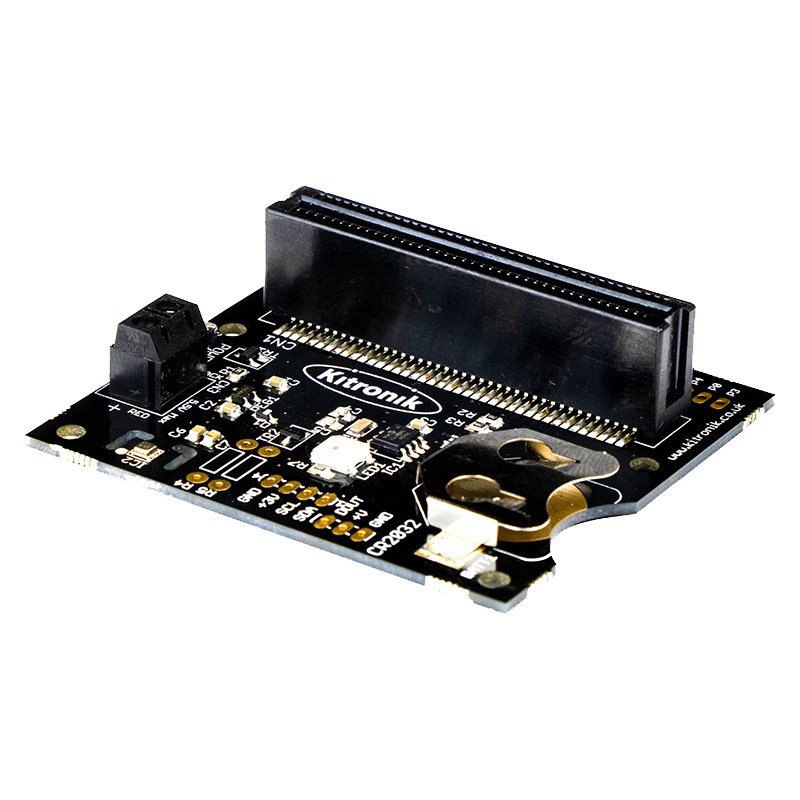 Add Real Time Clock and environmental sensing capabilities to the BBC micro:bit. The coincell battery ensures that the RTC & Klimate board continues to keep time when the board is not connected to a power source. 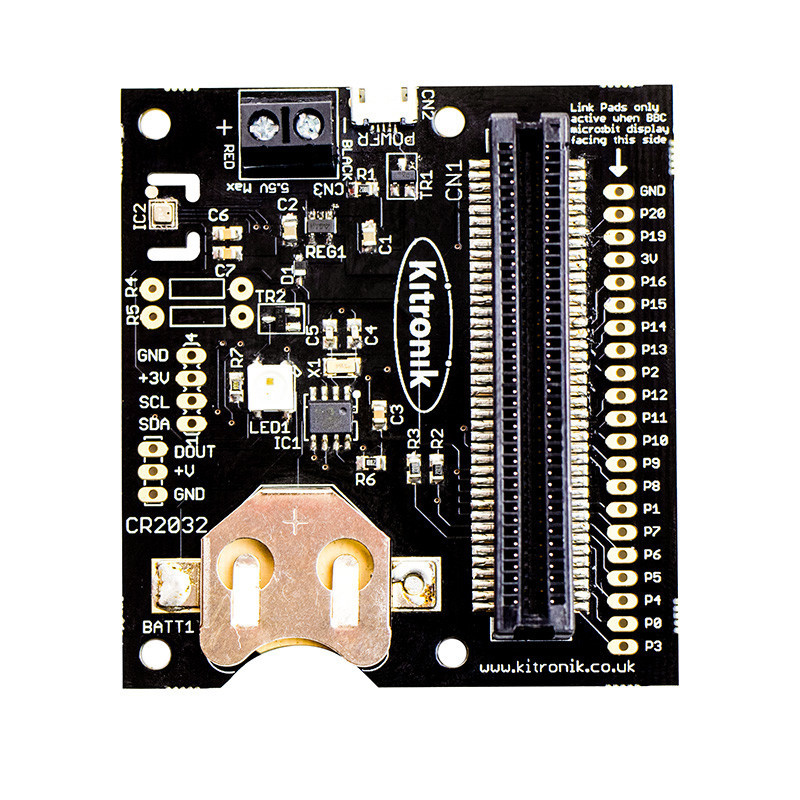 When the RTC & Klimate board is powered, it will also power the inserted microbit. 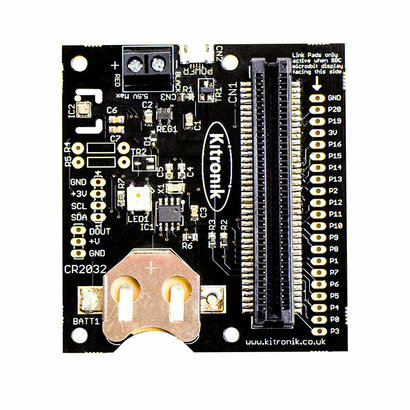 1 x Kitronik RTC & Klimate Board.